I prefer over-ear headphones, and these are some of the best-fitting over-ear headphones I’ve ever worn. They’re at least as comfortable as my Bose Quiet Comforts, and the headphone’s over-ear cups are particularly comfortable. I’ve worn them for multiple hours across multiple days, without any fatigue. First off, I do not have a musically trained ear. But I know what I like, and I like the sound from these Sony headphones. Highs are crisp, lows are punchy, and the vocals are incredibly clear. And the noise canceling is very effective—equal to my Bose, at least. The play/pause controller is large enough to find without finger fumbling, and it works very nicely—slide it to either side to skip forward or back, or push without sliding to pause/play or pick up/hang up the phone. The volume button is large, again to make it easily findable, and it has a bump on the increase end, so you can tell exactly where your finger is. These controls are intuitive and incredibly easy to use. There are two buttons on the other ear cup. One toggles the noise canceling on and off, and the other is the power/sync switch. When you toggle noise canceling, you get one of two two-step tones–descending for off, ascending for on. Press the power switch quickly while the headphones are on, and a voice will speak out the approximate battery level, which is a nice touch. Another nice touch is the red-circle “R” on the right side of the headband vs. the gray-circle “L” on the left, which makes it simple to figure out which way to put on the headphones. The included carrying case is nice, if not quite as sturdy (or as small!) as that of my Bose. While the headphones fold, they are definitely bulky and will take a fair bit of space in a bag or backpack. The headband expands and contracts with sturdy-sounding mechanical clicks; once in a position, I’ve not had them drop further, even while walking around. The Bluetooth range is better than that of the now-deceased Sentey headphones; I can walk quite a ways around the house while still getting a strong signal. And while there’s no Apple magic W1 chip in the Sony headphones, pairing was easy on my iPhone, my Mac, and the Apple TV. Bluetooth connections are incredibly fast—my old headphones could take several seconds, these pair in a second or less every time. 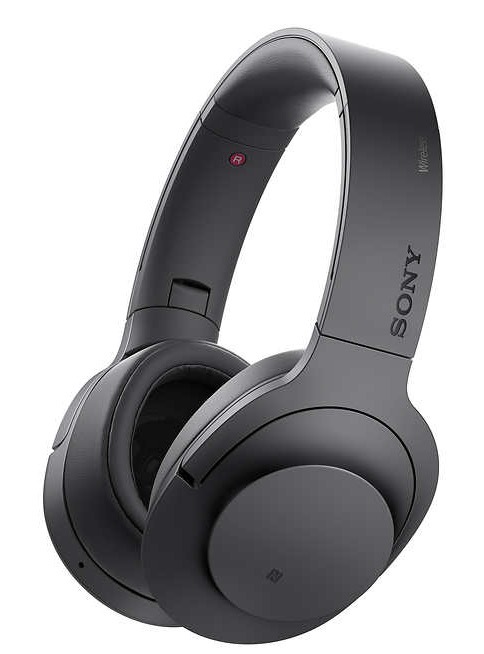 In summary, if you’re looking for a good pair of over-ear noise-canceling wireless (optionally wired) headphones, I’ve been very happy with these Sony MDR-100ABNs (though the name isn’t exactly memorable).